Cancer cells show a broad spectrum of bioenergetic states, with some cells using aerobic glycolysis while others rely on oxidative phosphorylation as their main source of energy. In addition, there is mounting evidence that metabolic coupling occurs in aggressive tumors, between epithelial cancer cells and the stromal compartment, and between well-oxygenated and hypoxic compartments. We recently showed that oxidative stress in the tumor stroma, due to aerobic glycolysis and mitochondrial dysfunction, is important for cancer cell mutagenesis and tumor progression. More specifically , increased autophagy/mitophagy in the tumor stroma drives a form of parasitic epithelial-stromal metabolic coupling. These findings explain why it is effective to treat tumors with either inducers or inhibitors of autophagy, as both would disrupt this energetic coupling. We also discuss evidence that glutamine addiction in cancer cells produces ammonia via oxidative mitochondrial metabolism. Ammonia production in cancer cells, in turn, could then help maintain autophagy in the tumor stromal compartment. In this vicious cycle, the initial glutamine provided to cancer cells would be produced by autophagy in the tumor stroma. Thus, we believe that parasitic epithelial-stromal metabolic coupling has important implications for cancer diagnosis and therapy, for example, in designing novel metabolic imaging techniques and establishing new targeted therapies. In direct support of this notion, we identified a loss of stromal caveolin-1 as a marker of oxidative stress, hypoxia, and autophagy in the tumor microenvironment, explaining its powerful predictive value. Loss of stromal caveolin-1 in breast cancers is associated with early tumor recurrence, metastasis, and drug resistance, leading to poor clinical outcome. The Warburg effect, also known as aerobic glycolysis, is defined as the propensity of cancer cells to take up high levels of glucose and to secrete lactate in the presence of oxygen. Warburg's original work indicated that while glucose uptake and lactate production are greatly elevated, a cancer cell's rate of mitochondrial respiration is similar to that of normal cells [1, 2]. He, however, described it as a 'respiratory impairment' due to the fact that, in cancer cells, mitochondrial respiration is smaller, relative to their glycolytic power, but not smaller relative to normal cells. He recognized that oxygen consumption is not diminished in tumor cells, but that respiration is disturbed because glycolysis persists in the presence of oxygen [1, 2]. Unfortunately, the perception of his original findings was simplified over the years, and most subsequent papers validated that cancer cells undergo aerobic glycolysis and produce lactate, but did not measure mitochondrial respiration, and just presumed decreased tricarboxylic acid (TCA) cycle activity and reduced oxidative phosphorylation [1, 2]. It is indeed well documented that, as a consequence of intra-tumoral hypoxia, the hypoxia-inducible factor (HIF)1α pathway is activated in many tumors cells, resulting in the direct up-regulation of lactate dehydrogenase (LDH) and increased glucose consumption. For updated reviews on the Warburg effect , the reader is encouraged to refer to the following papers [3, 4]. However, new findings compel us to reconsider the current model of cancer cell metabolism. First, not all tumors are associated with increased aerobic glycolysis, and in fact it is now clear that cancer cells utilize both glycolysis and oxidative phosphorylation to satisfy their metabolic needs. Experimental assessments of ATP production in cancer cells have demonstrated that oxidative pathways play a significant role in energy generation, and may be responsible for about 50 to 80% of the ATP generated [5–8]. Also, it should be considered that most studies were performed using isolated cancer cells, which may behave very differently from cancer cells in vivo, surrounded by their natural microenvironment  (see also Koukourakis and colleagues  for another viewpoint). Second, several studies now clearly indicate that mitochondrial activity and oxidative phosphorylation support tumor growth. Loss-of-function mutations in the TCA cycle gene IDH1 (isocitrate dehydrogenase 1) are found in about 70% of gliomas, but, interestingly, correlate with a better prognosis and improved survival, suggesting that severely decreased activity in one of the TCA cycle enzymes does not favor tumor aggressiveness . The mitochondrial protein p32 was shown to maintain high levels of oxidative phosphorylation in human cancer cells and to sustain tumorigenicity in vivo . In addition, STAT3 is known to enhance tumor growth and to predict poor prognosis in human cancers . Interestingly, a pool of STAT3 localizes to the mitochondria, to sustain high levels of mitochondrial respiration  and to augment transformation by oncogenic Ras [15, 16]. Similarly, the mitochondrial transcription factor A (TFAM), which is required for mitochondrial DNA replication and oxidative phosphorylation, is also required for K-Ras-induced lung tumorigenesis . Finally, when constrained to use glycolysis by depletion of mitochondrial DNA, melanoma B16 cells (B16ρ0) and breast cancer T47D cells (T47Dρ0), show severe impairment of tumorigenicity in vivo [18, 19]. There is also evidence that pro-oncogenic molecules regulate mitochondrial function. Cyclin D1 inhibits mitochondrial function in breast cancer cells . Over-expression of cyclin D1 is observed in about 50% of invasive breast cancers and is associated with a good clinical outcome , indicating that inhibition of mitochondrial activity correlates with favorable prognosis. Importantly, it was shown that the oncogene c-Myc stimulates mitochondrial biogenesis, and enhances glutamine metabolism by regulating the expression of mitochondrial glutaminase, the first enzyme in the glutamine utilization pathway . Glutamine is an essential metabolic fuel that is converted to alpha-ketoglutarate and serves as a substrate for the TCA cycle or for glutathione synthesis, to promote energy production and cellular biosynthesis, and to protect against oxidative stress . Interestingly, pharmacological targeting of mitochondrial glutaminase inhibits cancer cell transforming activity, suggesting that glutamine metabolism and its role in fueling and replenishing the TCA cycle are required for neoplastic transformation  (for a recent review on glutamine cancer metabolism, see ). It is increasingly apparent that the tumor microenvironment regulates neoplastic growth and progression. Activation of the stroma is a critical step required for tumor formation. Among the stromal players, cancer associated fibroblasts (CAFs) have recently taken center stage . CAFs are activated, contractile fibroblasts that display features of myo-fibroblasts, express muscle-specific actin, and show an increased ability to secrete and remodel the extracellular matrix [26, 27]. They are not just neutral spectators, but actively support malignant transformation  and metastasis , as compared to normal resting fibroblasts. For example, in a humanized mouse model of breast cancer, oncogenically driven human organoids develop tumors only if coinjected with immortalized fibroblasts and not with normal primary fibroblasts, suggesting that stromal activation is required for breast cancer formation . Importantly, the tumor stroma dictates clinical out-come and constitutes a source of potential biomarkers . Expression profiling has identified a cancer-associated stromal signature that predicts good and poor clinical prognosis in breast cancer patients, independently of other factors [32–34]. We and others have recently shown that a loss of caveolin-1 (Cav-1) in the stromal compartment is a novel biomarker for predicting poor clinical outcome in all of the most common subtypes of human breast cancer, including the more lethal triple negative subtype [35, 36]. A loss of stromal Cav-1 predicts early tumor recurrence, lymph-node metastasis, tamoxifen-resistance, and poor survival. Overall, breast cancer patients with a loss of stromal Cav-1 show a 20% 5-year survival rate, compared to the 80% 5-year survival of patients with high stromal Cav-1 expression. In triple negative patients, the 5-year survival rate is 75.5% for high stromal Cav-1 versus 9.4% for absent stromal Cav-1 . A loss of stromal Cav-1 also predicts progression to invasive disease in ductal carcinoma in situ patients, suggesting that a loss of Cav-1 regulates tumor progression . Similarly, a loss of stromal Cav-1 is associated with advanced disease and metastasis, as well as a high Gleason score, in prostate cancer patients . In order to mechanistically dissect how a loss of stromal Cav-1 induces a lethal microenvironment, we have employed Cav-1(-/-) null mice as a model system. Complementary studies were also performed with a coculture model of normal human fibroblasts and MCF7 breast cancer cells. Unbiased proteomic and transcriptional analysis has shown that Cav-1(-/-) null bone-marrow-derived stromal cells display the up-regulation of both myo-fibroblast markers and glycolytic enzymes, clearly indicating that a loss of Cav-1 promotes myo-fibroblast conversion and induces aerobic glycolysis in stromal cells . Thus, stromal cells lacking Cav-1 undergo aerobic glycolysis and secrete energy-rich metabolites (such as lactate and pyruvate) that directly feed cancer cells and fuel mitochondrial respiration of adjacent cancer cells. We have termed this novel hypothesis the 'reverse Warburg effect '. This novel idea has now also been independently confirmed by Pol and colleagues , who demonstrated that genetic ablation of Cav-1 in murine fibroblasts is indeed sufficient to functionally induce the onset of aerobic glycolysis via mitochondrial dysfunction . Interestingly, immunohistochemistry on human breast cancers lacking stromal Cav-1 has demonstrated the over-expression of key glycolytic enzymes, such as PKM2 and LDH, in the fibroblastic tumor stroma . In further support of this hypothesis, co-culture with cancer cells promotes Cav-1 down-regulation in adjacent fibroblasts. Importantly, when cultured under homotypic conditions, MCF7 cancer cells have a very low mitochondrial mass (the conventional Warburg effect ). However, co-culture with fibroblasts, which more closely mirrors the microenvironment of a naturally occurring tumor, promotes a very significant increase in mitochondrial mass in MCF7 cancer cells, suggesting that the Warburg effect might be an in vitro artifact . Importantly, lactate administration to homotypic MCF7 cancer cell cultures significantly increases mitochondrial mass, suggesting that lactate administration phenocopies the presence of reactive fibroblasts , by promoting mitochondrial biogenesis. These new data indicate that cancer cells and CAFs develop a 'symbiotic' or 'parasitic' relationship, with the vectorial and unilateral transfer of energy from glycolytic stromal cells to oxidative cancer cells (Figures 1 and 2). The autophagic tumor stroma model of cancer metabolism. 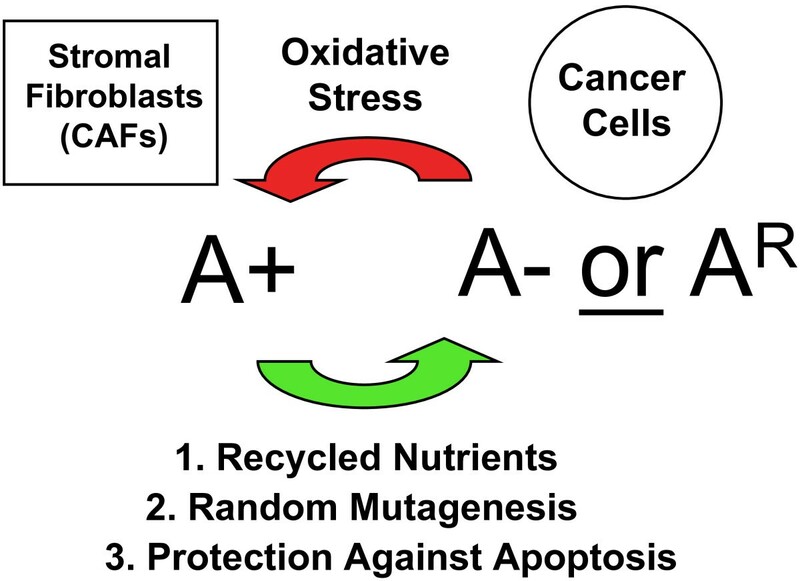 Cancer cells induce oxidative stress in adjacent cancer-associated fibroblasts (CAFs). This activates reactive oxygen species (ROS) production and autophagy. ROS production in CAFs, via the bystander effect, serves to induce random mutagenesis in epithelial cancer cells, leading to double-strand DNA breaks and aneuploidy. Cancer cells mount an anti-oxidant defense and up-regulate molecules that protect them against ROS and autophagy, preventing them from undergoing apoptosis. So, stromal fibroblasts conveniently feed and mutagenize cancer cells, while protecting them against death. See the text for more details. A+, autophagy positive; A-, autophagy negative; AR, autophagy resistant. The reverse Warburg effect. (a) Via oxidative stress, cancer cells activate two major transcription factors in adjacent stromal fibroblasts (hypoxia-inducible factor (HIF)1α and NFκB). This leads to the onset of both autophagy and mitophagy, as well as aerobic glycolysis, which then produces recycled nutrients (such as lactate, ketones, and glutamine). These high-energy chemical building blocks can then be transferred and used as fuel in the tricarboxylic acid cycle (TCA) in adjacent cancer cells. The outcome is high ATP production in cancer cells, and protection against cell death. ROS, reactive oxygen species. (b) Homotypic cultures (upper panels) of MCF7 cells (right) and hTERT-fibroblasts (left) were immunostained with a mitochondrial membrane antibody (red). Note that mitochondrial mass is lower in mono-cultures of MCF7 cells compared to fibroblasts. However, co-culture of MCF7 cells with fibroblasts (lower panel) induces a dramatic increase in mitochondrial mass in the 'central MCF7 cell colony', outlined by the dotted white oval. In contrast, mitochondrial mass is decreased in co-cultured fibroblasts. Panel (b) was modified and reproduced with permission from [41, 78]. Clinically, high glucose uptake has been exploited to monitor tumor growth using position emission tomography (PET) scanning via radiolabeled 2-deoxy-glucose. However, we should acknowledge that PET avidity does not necessarily correlate with high aerobic glycolysis. For example, PET is not useful in clear cell renal carcinomas [42, 43], which are the tumor 'prototype' in which the Warburg effect should sustain tumor formation. About half of clear cell renal carcinomas are due to mutations in the Von Hippel-Lindau (VHL) gene [44, 45], leading to HIF1α constitutive activation and forced induction of aerobic glycolysis [46–48]. Conversely, little attention is paid to understanding which cell- type or compartments within a tumor are most PET avid. In fact, the clinical use of PET is well established in Hodgkin's lymphomas , which are composed of less than 10% tumor cells, the rest being stromal and inflammatory cells . Yet, Hodgkin's lymphomas are very PET avid tumors, suggesting that 2-deoxy-glucose uptake may be associated with the tumor stroma. That the fibrotic component may be glucose avid is further supported by the notion that PET is clinically used to assess the therapeutic response in gastrointestinal stromal tumors (GIST), which are a subset of tumors of mesenchymal origin. Finally, pilot clinical studies have shown that PET is useful for detection of various forms of fibrosis, including pulmonary fibrosis . 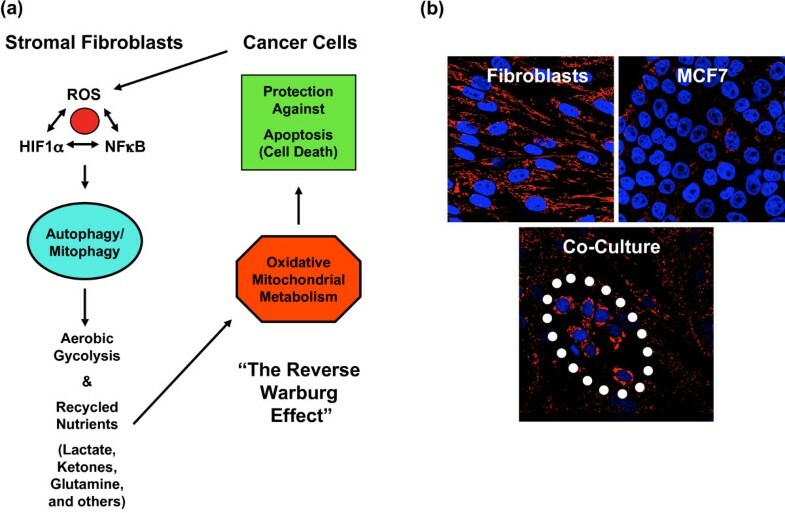 The reverse Warburg effect can also be described as 'metabolic coupling' between supporting glycolytic stromal cells and oxidative tumor cells. Metabolic cooperativity between adjacent cell-compartments is observed in several normal physiological settings. During folliculogenesis and early embryogenesis, oocytes are surrounded by supporting cumulus granulosa (CG) cells. Oocytes lack some crucial metabolic functions, such as the ability to utilize glucose, to produce cholesterol and to transport certain amino acids. Thus, oocytes control CG cell metabolism, promoting their glycolysis, cholesterol synthesis and amino acid uptake [52, 53]. Remarkably, both oocytes and zygotes can reach a two-cell stage only in the presence of pyruvate and oxaloacetate, but not using glucose [54, 55]. However, upon co-culture with CG cells, oocytes or zygotes can cleave to a two-cell stage also in the presence of glucose, clearly indicating that CG cells metabolize glucose and supply the oocyte with the glycolytic product pyruvate to permit maturation . In this regard, transcriptional profiling of CG cells and oocytes has revealed that key enzymes of the glycolytic pathway (aldolase A, enolase 1, LDHA, and PKM2) are very highly expressed in CG cells, but are undetectable in oocytes . These results indicate that granulosa cells support the development and maturation of oocytes and early embryos by providing them with essential nutrients, such as oxidative phosphorylation substrates (pyruvate and lactate ), amino acids , and cholesterol . Metabolic coupling is also normally observed in the brain between astrocytes and neurons, and this is known as 'neuron-glia metabolic coupling' [60, 61]. In this regard, glycolytic astrocytes generate high levels of lactate to support mitochondrial oxidative phosphorylation in adjacent neurons. Consistent with this idea, LDH is preferentially expressed in astrocytes, and the mitochondrial enzyme pyruvate dehydrogenase is present selectively within the neurons [62, 63]. Also, in skeletal muscle it is well established that glycolytic fast-twitch muscle fibers produce lactate, which is then secreted via monocarboxylate transporter (MCT) 4. Lactate is then taken up by the slow-twitch fibers expressing MCT1 and utilized as a substrate for oxidative phosphorylation [64, 65]. This form of metabolic coupling is known as the 'skeletal muscle lactate shuttle' . As such, it is perhaps not surprising that tumors may have also developed a form of metabolic coupling, specifically involving tumor-stromal interactions. 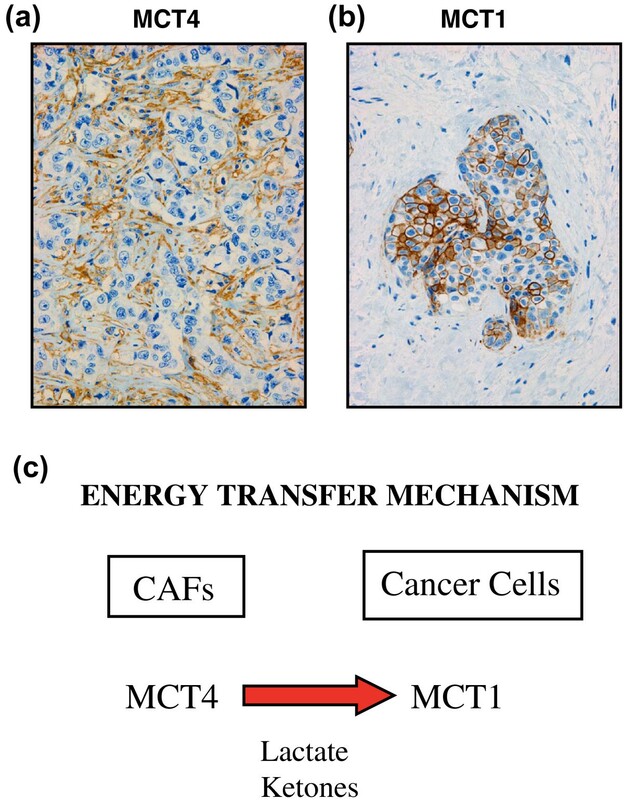 In further support of the existence of a 'lactate shuttle' in human tumors, we have now shown that CAFs express MCT4 (for lactate extrusion), while breast cancer cells express MCT1 (for lactate uptake) (Figure 3) . Interestingly, MCT4 expression in CAFs is induced by oxidative stress, and MCT4 is a known HIF1α target gene (see Discussion below) . Evidence supporting a 'lactate shuttle' in human tumors: compartmentalized distribution of monocarboxylate transporter (MCT)1/4. (a) MCT4 is expressed in the fibroblastic stromal compartment of human breast cancers. Note that MCT4 staining is absent from the tumor epithelial cells, but is present in the surrounding stroma. MCT4 staining outlines the cancer-associated fibroblasts that surround nests of epithelial cancer cells. (b) MCT1 is expressed in the epithelial compartment of human breast cancers. Note that MCT1 staining is present in the tumor epithelial cells, but is absent in the surrounding stroma. (c) The lactate shuttle: an energy transfer mechanism in normal tissue and human cancers. MCT4 functions primarily as a transporter that extrudes lactate from cells that are undergoing aerobic glycolysis and lack functional mitochondria. After lactate is extruded by MCT4 in cancer-associated fibroblasts (CAFs), lactate is then taken up by MCT1 in adjacent cancer cells. Similarly, ketones are transported by the same MCTs that handle lactate. Our studies suggest that metabolic coupling occurs between CAFs and adjacent tumor cells. Modified and reproduced with permission from . Recent studies have dissected the mechanism(s) by which a loss of stromal Cav-1 leads to an aggressive breast cancer phenotype, and have shown that oxidative stress plays a central role. The role of oxidative stress in sustaining tumor growth is underscored by the observation that reactive oxygen species (ROS)-mediated myo-fibro-blast conversion is sufficient to reduce tumor-free survival, and increases metastatic potential in a mammary tumor mouse model . Gene expression profiling of Cav-1(-/-) null bone-marrow-derived stromal cells has shown the up-regulation of gene transcripts associated with ROS production, and over-expression of the transcriptional targets of HIF1α and NFκB, suggesting that a loss of stromal Cav-1 induces oxidative stress, mimics hypoxia, and stimulates inflammation . Co-cultures of normal human fibroblasts and MCF7 cells indicate that cancer cells use oxidative stress as a weapon to trigger the conversion of adjacent fibroblasts into myo-fibroblasts . Cancer cell-induced oxidative stress potently perturbs the behavior of adjacent fibro-blasts, induces the lysosomal-mediated degradation of Cav-1, and promotes mitochondrial dysfunction, resulting in increased aerobic glycolysis . In turn, these glycolytic fibroblasts support tumor cell mitochondrial respiration and growth by actively transferring high-energy nutrients (such as lactate and pyruvate) to cancer cells. In support of the 'reverse Warburg effect ', comparison of the tumor-promoting properties of two fibroblast lines (named CL3 and CL4) with either mitochondrial or glycolytic metabolism has revealed that aerobic glycolysis in CAFs greatly promotes tumor formation. CL3 fibroblasts show oxidative metabolism and increased mitochondrial mass, whereas CL4 fibroblasts display a shift towards aerobic glycolysis and increased lactate production . Interestingly, in a xenograft model, CL4 fibro-blasts enhance the growth of mammary tumors by approximately eight- fold compared to CL3 cells, without a detectable increase in angiogenesis. Consistent with this growth-promoting effect , CL4 fibroblasts also increase the mitochondrial mass of co-cultured breast cancer cells . An oxidative-stress-rich micro-environment generates DNA damage in both cancer and stromal cells (Figure 1). We have shown that MCF7 cancer cells induce oxidative stress and promote DNA double-strand breaks in associated stromal cells, which are blocked by anti-oxidant treatments . Similarly, after three-dimensional co-culture with prostate cancer cells, bone-derived stromal cells undergo stable cytogenetic modifications by a ROS-mediated mechanism . Conversely, in an MCF7-fibroblast co-culture model, MCF7 cancer cells undergo aneuploidy and random mutagenesis , suggesting that CAFs facilitate the dynamic search for a more aggressive 'mutator phenotype' in cancer cells (Figure 1). Functionally, fibroblasts provide cancer cells with a six-fold protection against cell death  (Figure 2), via the up-regulation of the anti-apoptotic protein TIGAR . Cav-1 knockdown fibroblasts provide even greater protection for cancer cells against apoptosis, clearly indicating that a loss of stromal Cav-1 in humans may greatly facilitate tumor growth by suppression of cancer cell death . Thus, data supporting the 'reverse Warburg effect ' indicate that cancer cells and fibroblasts are metabolically coupled and mutagenically co-evolving [41, 73]. Cancer cells use oxidative stress to corrupt adjacent fibroblasts and to induce their metabolic re-programming . In this way, fibroblasts secrete energy rich metabolites that facilitate cancer cell survival. In addition, fibroblasts promote mutagenesis of cancer cells, leading to a more aggressive 'aneuploid' phenotype [41, 73]. Aneuploidy in cancer cells is known to be associated with poor clinical outcome. Metabolomic profiling reveals that Cav-1(-/-) null mammary fat pads display a highly catabolic metabolism, with the increased release of several metabolites, such as amino acids, ribose and nucleotides, and a shift towards gluconeogenesis, as well as mitochondrial dysfunction . These changes are consistent with increased autophagy, mitophagy and aerobic glycolysis, all processes that are induced by oxidative stress . Autophagy or 'self- eating' is the process by which cells degrade their own cellular components to survive during starvation or to eliminate damaged organelles after oxidative stress. Mitophagy, or mitochondrial-autophagy, is particularly important to remove damaged ROS-generating mitochondria. An autophagy/mitophagy program is also triggered by hypoxia [75, 76]. Hypoxia is a common feature of solid tumors, and promotes cancer progression, invasion and metastasis . Interestingly, via induction of autophagy, hypoxia is sufficient to induce a dramatic loss of Cav-1 in fibroblasts. The hypoxia-induced loss of Cav-1 can be inhibited by the autophagy inhibitor chloroquine, or by pharmacological inhibition of HIF1α [69, 78]. Conversely, small interfering RNA-mediated Cav-1 knock-down is sufficient to induce pseudo-hypoxia, with HIF1α and NFκB activation, and to promote autophagy/mitophagy, as well as a loss of mitochondrial membrane potential in stromal cells . These results indicate that a loss of stromal Cav-1 is a marker of hypoxia and oxidative stress. In a co-culture model, autophagy in cancer-associated fibroblasts was shown to promote tumor cell survival via the induction of the pro-autophagic HIF1α and NFκB pathways in the tumor stromal microenvironment . Finally, the mitophagy marker Bnip3L is selectively up-regulated in the stroma of human breast cancers lacking Cav-1, but is notably absent from the adjacent breast cancer epithelial cells . Another study has shown that cell-specific induction of autophagy by HIF1α activation in fibroblasts or MDA-MB-231 cells differentially affects tumor growth. In a xenograft model, HIF1α activation in fibroblasts greatly enhances the tumorigenicity of co-injected MDA-MB-231 cells, whereas HIF1α activation in MDA-MB-231 cancer cells suppresses tumor growth . Importantly, in this experimental setting, the levels of tumor angiogenesis were unchanged. As HIF1α triggers autophagy in both fibroblasts and cancer cells, these data demonstrate that the role of autophagy in driving tumor formation is cell-type specific, and that stromal autophagy, and not cancer cell autophagy, favors tumor growth. Several studies have demonstrated that the over-expression of autophagic markers, such as ATG16L and cathepsin K and D, in the stroma and not in tumor cells predicts poor prognosis [80–82]. Similarly, loss of autophagic markers, such as Beclin 1, in tumor cells correlates with poor clinical outcome, suggesting that activation of an autophagic program in tumor cells reduces tumor aggressiveness . Metabolome profiling of several types of human cancer tissues versus corresponding normal tissues have consistently shown that cancer tissues are highly catabolic, with the significant accumulation of many amino acids and TCA cycle metabolites [84, 85]. The levels of reduced glutathione were decreased in primary and metastatic prostate cancers compared to benign adjacent prostate tissue, suggesting that aggressive disease is associated with increased oxidative stress . Also, these data show that the tumor microenvironment has increased oxidative-stress-induced autophagy and increased catabolism. Taken together, all these findings suggest an integrated model whereby a loss of stromal Cav-1 induces autophagy/mitophagy in the tumor stroma, via oxidative stress. This creates a catabolic micro-environment with the local accumulation of chemical building blocks and recycled nutrients (such as amino acids and nucleotides), directly feeding cancer cells to sustain their survival and growth. We have termed this novel idea the 'autophagic tumor stroma model of cancer' . This new paradigm may explain the 'autophagy paradox', which is based on the fact that both the systemic inhibition and systemic stimulation of autophagy prevent tumor formation . We propose that vectorial energy transfer from the tumor stroma to cancer cells directly sustains tumor growth, and that interruption of such metabolic coupling will block tumor growth. Autophagy inhibitors (such as chloroquine) functionally block the catabolic transfer of metabolites from the stroma to the tumor, inducing cancer cell starvation and death . Conversely, autophagy inducers (such as rapamycin) promote autophagy in tumor cells and induce cell death . Thus, both inhibitors and inducers of autophagy will have a similar effect by severing the metabolic coupling of the stroma and tumor cells, resulting in tumor growth inhibition (cutting 'off ' the fuel supply). This model may also explain why enthusiasm for anti-angiogenic therapy has been dampened. In most cases, the clinical benefits are short term, and more importantly, new data suggest an unexpected link between anti-angiogenic treatments and metastasis. In pre-clinical models, anti-vascular endothelial growth factor (anti-VEGF) drugs (sunitinib and anti-VEGFR2 blocking antibodies) were shown to inhibit localized tumor formation, but potently induced relapse and metastasis [90–92]. Thus, by inducing hypoxia in the tumor microenvironment, anti-angiogenic drugs may create a more favorable metastatic niche . Hypoxia-induced autophagy may play a role by generating a catabolic micro-environment rich in chemical building blocks that can be directly used by cancer cells to sustain malignant transformation and metastatic progression. Finally, the autophagic tumor stroma model can also provide an explanation for systemic cachexia, which is progressive skeletal muscle and adipose tissue wasting, affecting up to 50% of all cancer patients and resulting in severe weight loss and shortened survival . Cachexia is the result of increased energy consumption and higher metabolic rates . Based on our data, we envision that cancer leads to a generalized catabolic state via an autophagic-mechanism that generates building blocks and starves the rest of the body. While the exact signaling pathways governing this phenomenon are not yet fully elucidated, it is clear that oxidative stress-induced autophagy functions as a driver of muscle wasting . For example, skeletal muscles from tumor-bearing mice showed impaired Akt activation and a more than 50-fold induction of Bnip3, a well recognized marker of autophagy/mitophagy . These findings also help explain why patients with metabolic syndrome and diabetes have an increased risk for the development of multiple epithelial cancers, due to their constitutive and systemic activation of the autophagic program, and the over-production of high-energy nutrients, such as lactate and ketones . 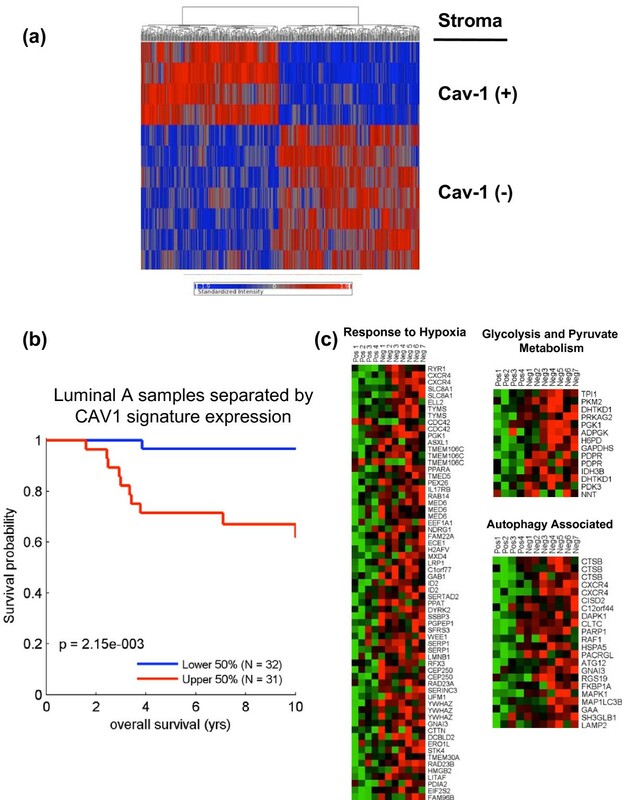 We have recently used laser-capture micro-dissection of the tumor stroma from human breast cancers to directly validate that a loss of stromal Cav-1 is transcriptionally associated with oxidative stress, hypoxia, autophagy, and mitochondrial dysfunction, via gene-set enrichment analysis (Figure 4) . In addition, we see that oxidative stress in CAFs induces cytokine production via NFκB activation, directly linking inflammation with autophagy/catabolism in the tumor stroma . So, cachexia may start locally as stromal autophagy, and then spread systemically via cytokine production and inflammation, which also drive autophagy . Molecular profiling of a Cav-1 deficient tumor micro-environment in breast cancer patients. (a) The transcriptional profiles of caveolin-1 (Cav-1)-positive (+) tumor stroma (N = 4) versus Cav-1-negative (-) tumor stroma (N = 7) were compared, via laser-capture microdissection. We identified 238 gene transcripts that were up-regulated and 232 gene transcripts that were down-regulated in the stroma of tumors showing a loss of Cav-1 expression. Note that the two patient populations are transcriptionally distinct. (b) The Cav-1-deficient stromal gene signature is associated with poor survival in estrogen receptor-positive and luminal A breast cancer patients. Note that the Cav-1-deficient stromal signature is clearly associated with decreased overall survival. (c) Heat maps of the gene transcripts associated with the response to hypoxia, glycolysis, and autophagy. Note that Cav-1-deficient stroma shows the up-regulation of hypoxia target genes (65 transcripts), glycolysis/pyruvate metabolism (15 transcripts), and autophagy (22 transcripts). Modified and reproduced with permission from . In direct support that cancer cells use mitochondrial oxidative metabolism, many investigators have shown that cancer cells are 'addicted' to glutamine [24, 100]. Glutamine is a non-essential amino acid that is metabolized to glutamate and enters the TCA cycle as alpha-ketoglutarate, resulting in high ATP generation via oxidative phosphorylation [2, 22, 101–103]. Recent studies also show that ammonia is a by-product of glutaminolysis [104–106]. In addition, ammonia can act as a diffusible inducer of autophagy [104–106]. Given these observations, glutamine addiction in cancer cells provides another mechanism for driving and/or maintaining autophagy in the tumor micro-environment (Figure 5). In support of this idea, we have previously shown that a loss of Cav-1 in the stroma is sufficient to drive autophagy, resulting in increased glutamine production in the tumor micro-environment . Glutamine utilization in cancer cells and the tumor stroma. Oxidative mitochondrial metabolism of glutamine in cancer cells produces ammonia. Ammonia production is sufficient to induce autophagy. Thus, autophagy in cancer-associated fibroblasts provides cancer cells with an abundant source of glutamine. In turn, the ammonia produced maintains the autophagic phenotype of the adjacent stromal fibroblasts. See text for details. TCA, tricarboxylic acid. 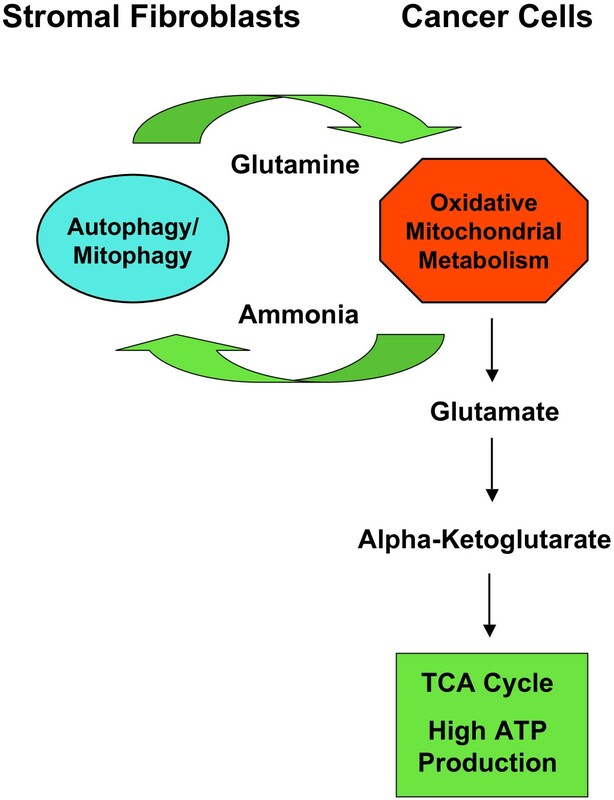 Thus, this concept defines a new vicious cycle in which autophagy in the tumor stroma transfers glutamine to cancer cells, and the by-product of this metabolism, ammonia, maintains autophagic glutamine production (Figure 5). This model fits well with the 'autophagic tumor stroma model of cancer metabolism', in which energy-rich recycled nutrients (lactate, ketones, and glutamine) fuel oxidative mitochondrial metabolism in cancer cells. We have recently proposed that cancer cells behave like 'parasites', by inducing oxidative stress in normal host fibroblasts, resulting in the production of recycled nutrients via autophagy [41, 69, 78]. This is exactly the same mechanism by which infectious parasites (such as malaria) obtain nutrients and are propagated by inducing oxidative stress and autophagy in host cells [107–109]. In this regard, malaria is an 'intracellular' parasite, while cancer cells may be thought of as 'extracellular' parasites. This explains why chloroquine is both an effective anti-malarial drug and an effective anti-tumor agent, as it functions as an autophagy inhibitor , cutting off the 'fuel supply' in both disease states. Are there any examples of cancer cells that act as infectious parasites? Surprisingly, the answer is yes . There are four known types: canine transmissible venereal tumor (CTVT), which is a sexually transmitted disease that occurs in feral dogs  - it is transmitted through coitus, licking/biting, or sniffing; devil facial tumor disease, spread among Tasmanian devils via facial biting [113, 114]; contagious reticulum cell sarcoma, which is transmitted between Syrian hamsters via mosquito bites [115, 116]; and malignant fibrous histiocytoma, which was transmitted from a cancer patient to his surgeon  during an injury that occurred when the surgeon was operating. These parasitic cancers are all transmitted by allografting, so the cancer cells literally 'metastasize' from one affected host to another 'naïve' host, in an infectious manner that does not involve a virus. Experimentally, the most is known about CTVT. This disease is thought to have originated in ancient wolves or coyotes, and the tumor cells themselves act as the infectious agent. As such, these cancer cells are genetically distinct from their hosts, as determined by genomic sequence analysis of their nuclear DNA . CTVT represents the oldest known cancer cell line that has been continuously propagated, most likely for more than 10,000 years [118, 119]. Interestingly, it has recently been shown that CTVT tumor cells survive by periodically 'capturing' mitochondrial DNA from their hosts [119, 120]. Thus, it has been suggested that these CVCT tumor cells have survived for more than 10,000 years by maintaining and renewing their capacity for oxidative mitochondrial metabolism by 'stealing' host cell mitochondrial DNA [119, 120]. In accordance with this idea, CTVT is highly sensitive to adriamycin/doxorubicin therapy , a chemo-therapeutic agent that also functions as a mitochondrial poison. Similarly, it has been independently shown that human cancer cells can 'steal' live mitochondria or mitochondrial DNA  from adjacent mesenchymal stem cells in culture, which then rescues aerobic glycolysis in these cancer cells . This is known as mitochondrial transfer . Interestingly, others have shown that metastatic breast cancer cells show the up-regulation of numerous mitochondrial proteins , specifically associated with oxidative phosphorylation, as seen by unbiased proteomic analysis . Thus, increased mitochondrial oxidative metabolism may be a key driver of tumor cell metastasis. In further support of this argument, treatment of MCF7 cancer cells with lactate is indeed sufficient to induce mitochondrial biogenesis in these cells [41, 78] (Figure 6). To determine if these findings may be clinically relevant, a lactate-induced gene signature was recently generated using MCF7 cells . This gene signature shows that lactate induces 'stemness' in cancer cells, and this lactate-induced gene signature predicts poor clinical outcome (including tumor recurrence and metastasis) in breast cancer patients  (Figure 6). These findings are consistent with experiments showing that intraperitoneal injection of lactate in an MDA-MB-231 xenograft model results in an approximately ten-fold increase in lung metastasis . 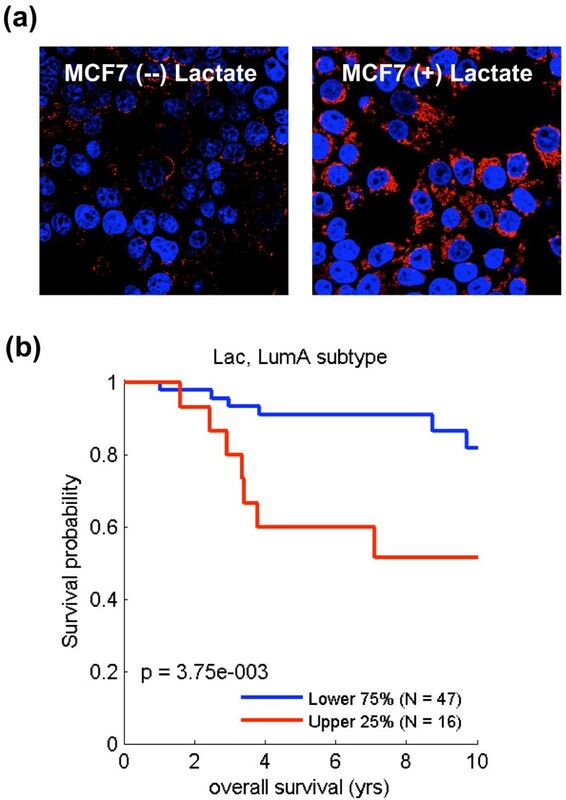 Lactate treatment of estrogen receptor-positive breast cancer cells drives mitochondrial biogenesis, leading to poor survival in a subset of luminal A breast cancer patients. (a) Lactate-treated (10 mM) MCF7 cells show a significant increase in mitochondrial mass, as visualized by staining with antibodies against mitochondrial marker proteins. (b) Lactate-treated (10 mM) MCF7 cells were subjected to transcriptional profiling (exon-array) to generate a gene signature. Interestingly, this lactate-induced gene signature predicts poor clinical outcome in estrogen receptor-positive/luminal A breast cancer patients, which represent nearly 60 to 70% of cases, and is the most common type of breast cancer. Modified and reproduced with permission from . MPL and his laboratory were supported by grants from the NIH/NCI (R01-CA-080250; R01-CA-098779; R01-CA-120876; R01-AR-055660), and the Susan G Komen Breast Cancer Foundation. FS was supported by grants from the WW Smith Charitable Trust, the Breast Cancer Alliance (BCA), and a Research Scholar Grant from the American Cancer Society (ACS). RGP was supported by grants from the NIH/NCI (R01-CA-70896, R01-CA-75503, R01-CA-86072, and R01-CA-107382) and the Dr Ralph and Marian C Falk Medical Research Trust. The Kimmel Cancer Center was supported by the NIH/NCI Cancer Center Core grant P30-CA-56036 (to RGP). Funds were also contributed by the Margaret Q Landenberger Research Foundation (to MPL). This project is funded, in part, under a grant with the Pennsylvania Department of Health (to MPL). The Department specifically disclaims responsibility for any analyses, interpretations or conclusions. This work was also supported, in part, by a Centre grant in Manchester from Breakthrough Breast Cancer in the UK (to AH) and an Advanced ERC Grant from the European Research Council. Dr MP Lisanti would especially like to thank Drs Craig B Thompson, Tak W Mak, Michel L Tremblay, and Robert S DiPaola (other participants of the ASBMB/AACR 2011 Meetings) for their feedback, thoughtful comments, and helpful suggestions. This review was recently presented as a lecture at the AACR 2011 Meeting in the Educational Session 'Autophagy and Cell Death' on 2 April 2011 (Orlando, FL). It was also presented as a lecture at the Experimental Biology 2011-ASBMB Meeting (Washington, DC) at the session on 'Metabolism and Cancer' on 13 April 2011.